If you are looking for flight fares, please check the cheap flights Denpasar Bali to Bangkok, or you can use the search form at the top. There are 5 airlines with scheduled flights between Denpasar Bali to Bangkok. Weekly there are 44 flights scheduled between Denpasar Bali to Bangkok. The earliest flight scheduled between Denpasar Bali to Bangkok is at 01:35. The latest flight scheduled between Denpasar Bali to Bangkok is at 19:40. Before you book a flight you can use Utiket to find the flight schedule for Denpasar Bali to Bangkok for Garuda Indonesia, Lion Air, Thai Lion Air, Batik Air, Wings Air, Citilink. All flight data and flight times are real-time and accurate. Utiket not only just finds cheap flights, we can also calculate and find transfer flights. We do not add any commission or fees to a booking you make, making it the best place to find cheap flights for your journey Denpasar Bali to Bangkok. Follow the links to search and book your cheap flight Denpasar Bali to Bangkok directly with the airline or one of our partnering travel agent. 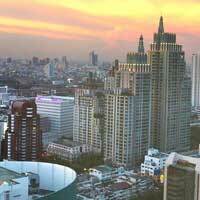 Need place to stay in Bangkok?